Last edited by zoran1983 on Sun Sep 07, 2014 8:32 pm, edited 1 time in total. Re: Just paid for a parking ticket and I was no where near . Tell them you received a ticket in front on their property, and if they know what happened. 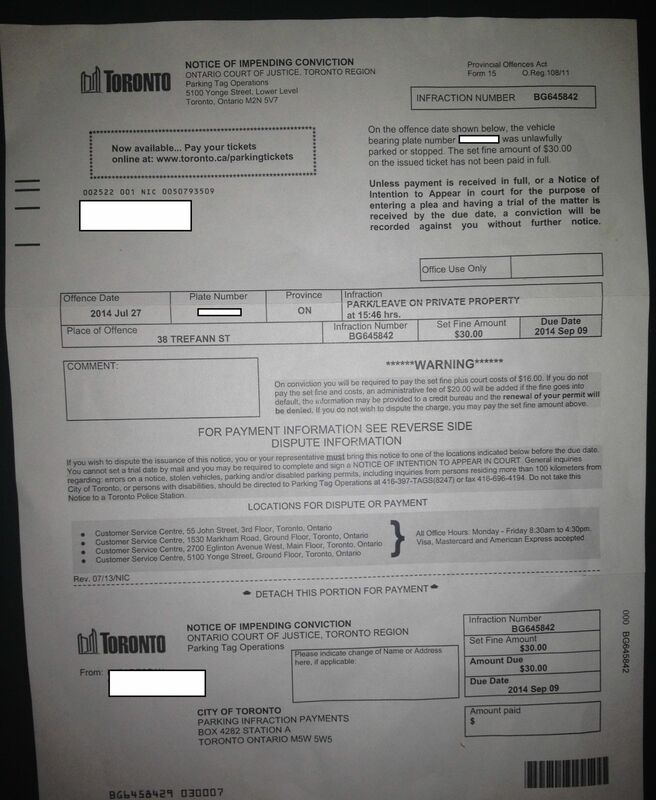 To receive this type of ticket, the property owner would have contacted parking enforcement. So if you can't get information from the city, you can try getting it from the property owner. It's unlikely you'll receive refund or compensation unless you go through the trial process. Most likely the parking enforcement officer recorded the wrong plate number; in most jurisdictions the make, type (4D, 2D, SUV, Van), colour, val-tag (plate expiry date) are on the face of the ticket. This would have been very easy for you to fight, especially if the any of the above didn't check out with your specific vehicle. Also are both plates still attached to your vehicle? Just make sure you're not missing one that someone has "borrowed". It's pretty annoying that you might be out $30 due to a typo. FYI, top right of your image still shows your plate if you want to edit it out. That is annoying because you probably could have beaten it. However it would have likely involved 2 trips into Toronto, one to file your Notice of Intention to Appear and another to show up in court. Sadly you are probably right that it wouldn't be worth the time off work to argue it.